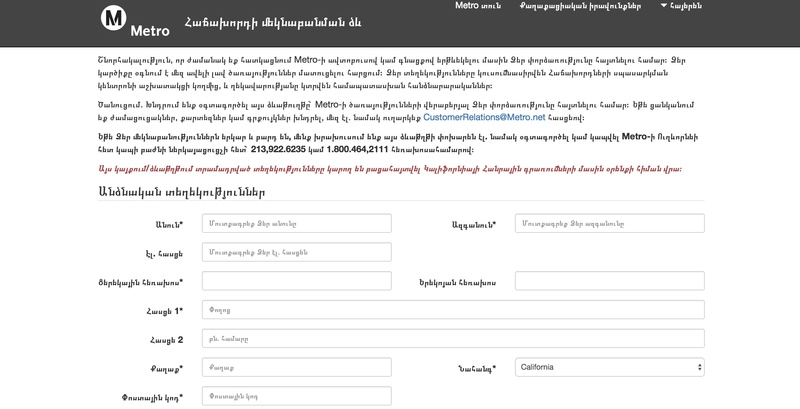 An example of Metro’s new multi-language comment forms. Metro’s Office of Civil Rights, Customer Care and ITS departments are working to enhance the customer experience via new multilingual comment forms to assist those with limited English proficiency. Those with limited English proficiency who wish to submit their comments or concerns to Metro Customer Care representatives can do so through email in any of the nine identified languages in Metro’s Limited English Proficiency Policy (LEP): English, Chinese, Spanish, Korean, Vietnamese, Japanese, Russian, Armenian, Thai and Khmer. Metro’s Customer Care Department has utilized a telephone-based service to speak to customers in other languages, but this new process now allows Metro to serve LEP customers through the website at metro.net. If the LEP customer wants to submit a comment form, they can select the form in any of the identified LEP languages, type their comments using other alphabets or characters and submit their comments for review and response. “This is great news for our diverse population throughout the region and a great improvement for online users in assisting them in their native languages as they communicate with Metro about their rider experiences,” said Metro Board Chair and Los Angeles County Supervisor Sheila Kuehl. Metro has contracted vendors to provide translation of the comment forms. Once an answer is prepared, a Metro Customer Care agent will respond to the customer through their preferred method by either contacting the person with an interpreter or sending a translated email response. The translation process and response back to the customer is expected to take three to five business days.